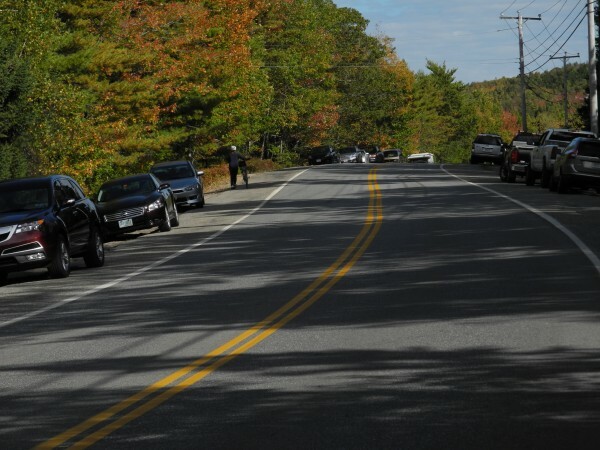 Cars were parked alongside Eagle Lake Road near an access point for Acadia National Park's carriage trails on Saturday afternoon. Park rangers remaining on duty during the partial government shutdown said that they were overwhelmed by visitors ignoring the barricades to bike, hike and otherwise enjoy the park. Rangers, search and rescue volunteers and emergency response crews on Saturday helped a woman who was injured while hiking Flying Mountain. The woman was one of many people visiting Acadia National Park despite the partial government shutdown which closed the park several days ago. Acadia National Park rangers and Mount Desert Island search and rescue personnel helped a 69-year-old woman who was injured Saturday morning while hiking Flying Mountain. BAR HARBOR, Maine – Thanks to the partial government shutdown, Acadia National Park is closed. But try telling that to the crowds of people — tourists and locals alike — who took advantage of Saturday’s beautiful weather to bike on the carriage trails and hike the park’s mountains anyway. “It’s perfect weather, and there’s a zillion people out there, walking around the barricades,” said a Chicago woman who declined to give her name. She and her husband had just biked around Eagle Lake on their first, long-planned visit to the park, and were looking for ideas for a short hike to do next. On Saturday, he was one just four rangers on duty when a 69-year-old Portland woman fell and hurt herself while hiking on Flying Mountain and could not hike out. The woman’s companion, a registered nurse, was able to control the bleeding from a gashed knee while waiting for medical help, Pontbriand said. Another ranger checking the barricades on the west side of the park got to the scene less than half an hour after the 10:54 a.m. call and helped the woman, who was not being named in accordance with park policy. Pontbriand said that all four rangers and five Mount Desert Island Search and Rescue volunteers helped with carrying out the woman on a wheeled litter. They brought her to the trailhead, where they placed her in the back of a ranger pickup truck and then drove her to the nearest road. There, they were met by the Southwest Harbor Ambulance, which brought her to the Mount Desert Island Hospital in Bar Harbor for treatment. The Southwest Harbor Fire Department also assisted with the rescue, he said. If there had been another emergency at the same time, rangers would have had to determine which had the higher priority and make the other injured person wait, he said, adding that the minimal staffing makes rescue efforts extra difficult. The situation is hard on park staff, who usually spend their time encouraging visitors to enjoy Acadia. Lots of people in the area hope that message will be reversed, and soon. Nancy O’Brien, the owner of Fiore, a speciality olive oil and vinegar shop in downtown Bar Harbor, said that so far, the park’s shutdown has not negatively impacted her business. She said that visitors with suddenly limited recreation options may have decided to go shopping instead.